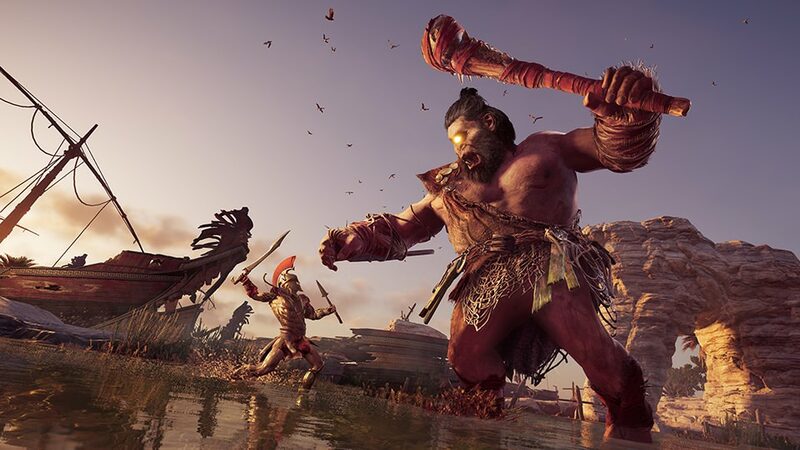 Assassin's Creed Odyssey: November Updates include Free Story Content, a Mythical Creature and more! Ubisoft unveils plans for content coming to their open world action game Assassin's Creed Odyssey in November. Includes free story content, new items and more! As mentioned earlier, Assassin's Creed Odyssey will continually get fresh content post-launch with free story content in the shape of the "Lost Tales of Greece" that will tell the story of characters from the game in new ways. These episodes will be releasing roughly every 6 weeks (in between the paid DLC) and the first one is available today! In "The Show Must Go On", you'll be revisiting the Battle of 300 as an actor playing King Leonidas. There's also the second Lost Tale of Greece, "Divine Intervention" which will see you meeting a mysterious woman that will test your skills with various trials. These quests will appear automatically and will be marked on the game map once you've reached Episode 5 in the story. There's no time limit and they can be completed whenever. Finishing the Lost Tales will give players new rewards. Prepare to do battle with the terror of Steropes the Cyclops when the first mythical creature is added to the game on November 13th. When the Cyclops launches a new quest "The Lightning Bringer" will appear in your quest log and you'll be able to take him down to get a new Legendary Bow. Be warned though as he'll be a high level challenge and only those brave enough will be able to defeat him!. Weekly Epic Events are also on the horizon which will see you taking on a Mercenary or Epic Ship to get Orichalcum, which can then be spent at the Oikos of the Olympians merchant. You may also get a new ship design or piece of equipment to use. Those seeking to take these Epic Events on must be at least level 30 or higher. CUSTOMIZATION: Players will finally be able to decide what gear they're wearing as the team are adding a feature to choose the look of your gear without giving up stats on a certain piece. Like the helm you were given at level 5? You can add that look to all helms as you progress! No longer will you be forced to switch gear with an ugly looking helm that has better stats. LEVEL CAP: Later in November the level cap will be raised by 20 levels and takes the game from level 50 to level 70. For those who have reached level 50, the XP they earn before the update will be given new ability points. AUTO-CRAFTING ARROW: A new feature that was recently added is the ability to auto-craft arrows when the player is running low. This will happen automatically if the player has enough resources available. GAMEPAD CUSTOMIZATION: Accessibility is important for players and the game now supports Gamepad customisation to allow players to decide what their keys do and more. GEAR UPGRADES: Resources required to upgrade pieces of gear have been reduced. XP BOOSTERS: Ubisoft wants players to have more control over their XP boosts, so starting with patch 1.0.7 a new option will be added to the game to pause and resume any temporary or permanent booster. This will ensure that players do not waste their boosts. Assassin's Creed Odyssey is available now, some features are live today and some will be added later in November.